In this article we are going to cover How to Find all nested stored procedure – Stored procedure called in another procedure. 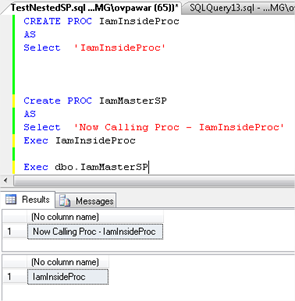 How to find which stored procedure had been call in side which stored procedure? What are relationships of stored procedure with each other? This script will display relationships of stored procedure with each other. INNER JOIN sys.objects OBJDEP ON sysdepends.DEPID = OBJDEP. Hope you will like How to Find all nested stored procedure – Stored procedure called in another procedure.